Mama Nibbles: Planning Our Healthy Child Healthy World Party! Planning Our Healthy Child Healthy World Party! This past week I have been taking some time to plan our Healthy Child party. I've found some great ways to make decorations and invitations from recycled items, they are also money savers since I am just re-using items we already have. The first item I worked on were my invitations. Invitations help to set the whole tone of a party in my opinion so I wanted them to be perfectly inline with my theme of *healthy and green*. I designed a quick template, filled it in with our pertinent info, printed it and then glued (using homemade glue) to some rectangles I'd cut out from a brown paper bag with some jagged scrapbooking scissors for a fun edge...viola we had invites that are cute and recyclable. Here is my design below. I took out my personal info so you all could see. I have a space for a stamp but most will be hand delivered since we live close enough to just walk to our intended guest's homes. So now that I have my invites all ready I can move on to my favorite part and that would be decorations! 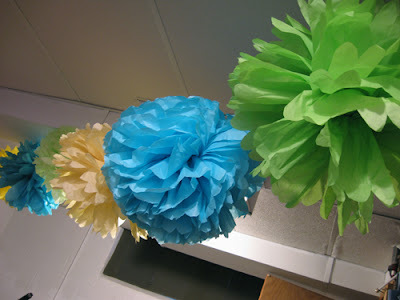 I have been eying some fun party poofs for a while and since I am a saver of tissue paper I knew they would be the perfect decor. It seems like most people give gift bags now-a-days, mostly to us adults because unwrapping a gift is maybe not the most adult thing to do? IDK but I have a small hoard of tissue paper from all my gifts I've gotten for about the past 5 years, seriously I do! Here is a picture of the poofs, they are SO cute! *You can click the image to be taken to a tutorial I found on YouTube if you wish to try them out* Once we are finished with these I will flatten them back out and re-use again for another party until they are too ragged looking then into the recycle bin they will go. We decided to have our party at a nearby park that has a gorgeous trail on a nature preserve plus a gazebo for our party to be under and some great play things for all the kids. The trail at this particular park is absolutely gorgeous, you can walk way back into the woods and tread over top of the marshy ground on a board walk to look at little ponds and tons of nature. I think the park is the perfect setting for this particular party. If it rains we plan to come back to our little home but hopefully it stays nice out. The party will be at 3 pm. I figure this will give everyone invited time for naps and then we don't have to provide a meal but there will be snacks! 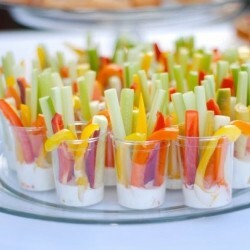 I am going to be preparing some vegetable cups I found on Pinterest, they look so tasty and need no tableware. I think I may be using some ball jelly jars for these since those will be washable. The person that pinned this did not source it properly so it took me some searching but alas I did not find the original source. If you know who made these let me know because I'd love to link them to this photo. Just another reminder to please link your pins properly on Pinterest! For drinks we plan to make some low sugar lemonade, maybe pink lemonade too. I'll probably bring a couple large pitchers for that since single serve packages for drinks are very wasteful. There is a video for all guests to watch that comes in the Healthy Child Party Kit and for that I plan to have my laptop charged up so that we can watch it on there. For tablecloth I will probably use some old fabric I have lying around. I sew once in a while so I have a small stash. I can't wait to share all of the fun samples we received in our kit from Healthy Child Healthy World plus hand out all the amazing swag. If you missed out this time around then be sure to click through to their Facebook page from the website so that you can stay up to date on all the news.